Cooperative Intelligent Transport Systems are key to reducing both accidents and traffic jams, thus improving the environment. The major challenges are efficient traffic flows, better use of the road capacity and improved safety. To meet these challenges, we must develop and improve not only the infrastructure and the vehicles but also the logistics systems, information systems and collaborative- and business models. Communication between road users, particularly from one vehicle to another and between vehicles and infrastructure, will facilitate their cooperation and result in more efficient transport systems. In 2014 European Committee for Standardisation (CEN) and European Telecommunications Standards Institute (ETSI) released the first set of standards of the cooperative intelligent transport system (C-ITS). These standards define the ITS communication architecture including message formats as well as the information storage of ITS applications: the local dynamic map (LDM). In an efficient traffic management system it is vital to be able to aggregate LDMs of all relevant actors to a global dynamic map (GDM) from which strategic and tactical traffic management decisions can be made. ÅF will provide a detailed digital 3D map of AstaZero roads and surroundings (guard rails, poles, signs, etc.). Additionally, an efficient but accurate CAD representation of same data will be established, suitable for distribution in an ITS network. 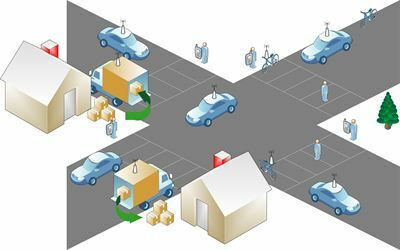 Map-matching with on-board sensors will be developed in order to create an affordable yet high-fidelity positioning based on sensor fusion and smart filtering. The project result will be important for the development of a Swedish infrastructure for ITS. Intelligent traffic management based on ITS will be demonstrated, which has the potential to reduce both accidents and traffic jams, thus improving the environment and health of the Swedish population. This is the first time intelligent traffic management based on ETSI ITS standards will be demonstrated at full scale in Sweden. Moreover, we will build a world-leading infrastructure for the development and testing of the combination of ITS and Active Safety solutions and services at AstaZero. Starting equipping AstaZero with open ITS systems and prototypes will broaden the spectrum of prototyping, development and testing services, which can be offered by AstaZero to customers and research colleagues in industry and academia. At the same time, it will facilitate the development of ITS-based systems and services for many companies and academia, leading to the fast growth of the ITS-research and industrial development. ÅF, SP Sveriges Tekniska Forskningsinstitut, Volvo Car Corporation, Chalmers University of Technology and AstaZero. For more information, contact Christian Larsson.